Emma Lawrenson is an artist/printmaker living in West Yorkshire, UK. We sell several of her limited edition silkscreen prints - Yellow Stem, Twenty-Eight Leaves, Three Orange Leaves, Study in Ten and Camelia Bud. 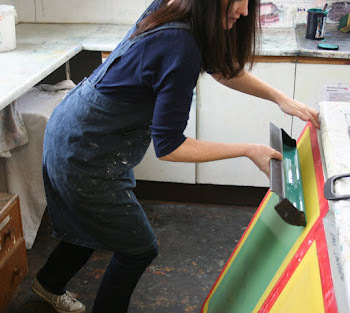 Emma studied printmaking at the Royal College of Art London, and fine art at the University of Reading. She has exhibited in galleries all over Europe, and also held solo exhibitions. She was recently selected from over 12,000 entries to exhibit in the Royal Academy London Summer Exhibition. Emma returned to printmaking after a break to have children. All her designs are original and made entirely by hand, and her work consists of two contrasting styles. Depending on her mood she draws irregular shapes, often taken from the surrounding landscape, or works with hard-edged geometric shapes and forms inspired by her immediate environment. She loves repetition, and uses hand-drawn lines, stripes and patterns to add interest and texture to her work. She is also inspired by American colour field painters, St Ives artists, and 1950's designs. Her work has featured in publications such as Art Review, Vogue, 25 Beautiful Homes, Good Homes Magazine, London Evening Standard.